Flash cards are not new to teaching and learning. Teachers have been using flash cards, or flashcards, or flip cards of one kind or another to teach vocabulary and other concepts for a very long time. However, the introduction of digital flash cards has added a new dimension to this great learning tool. In this post we’ll look at the reasons for the ongoing popularity of flash cards, and why they are useful to include in language teaching and digital language learning materials. At some time in our lives, most of us have had to study for a test or learn information quickly, possibly to pass the theoretical part of a driving test or a school history exam, in a foreign language classroom, or even to memorise useful phrases just before visiting a country where you don’t speak the language. We are all different. Different learners, of course, have different preferences when it comes to how to speed up the learning process. So why do flash cards have a universal appeal when it comes to learning, and how can they best be used in an e-learning context? A simple example of a flash card is a card with an image on one side and a word on the other, or a question on one side and an answer on the other. The language learner engages in a process of looking, remembering and testing herself until she can recall the word, or phrase, or question after longer periods of time, and this new language becomes part of the learner’s active repertoire. This process of attempting to recall information can help to improve the chances of remembering new information and continuing to remember it as time passes. Flash cards are ideal for this type of activity because they can be recycled; the learner can revisit them again and again over time. As any teacher and language learner knows, you need to see a new language item more than once before you can remember it and actively use it. Flash cards are an ideal way of providing opportunity for active recall, this process of trying to remember. Using flash cards can be a motivating and fun way of memorising or revising new vocabulary. There is something inherently challenging about memorising items in this way and then testing yourself. Proof of this is the large number of flash card vocabulary apps that are now available for language learners. As language learning tools, digital flash cards do have a lot to offer. They are motivating and inherently challenging. It’s satisfying to see that we can remember new words. They can be visually memorable and can carry a lot of information for the language learner; for example, meaning, spelling and pronunciation features. Flash cards can be used for both receptive activities; where learners look and recognise the word, and also productive activities, where learners are required to say or use the word. Flash cards are ideal for recycling, or spaced repetition. You usually need to come across a new word a number of times before you can begin to remember it and use it correctly. As a simple and practical way of introducing new vocabulary, where the learner sees an image, sees the word or phrase, and hears how the word or phrase is pronounced. As a way of testing that a learner understands the meaning of a word or phrase. A flash-card exercise can be followed by a memory exercise; for recognition and then recall. 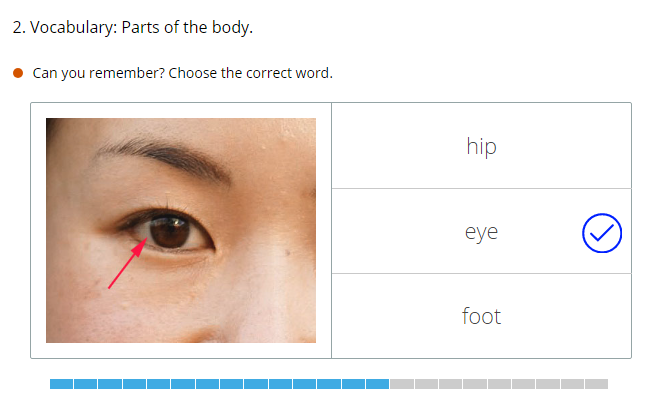 As quiz activities involving cognitive depth, the learner’s reasoning and thinking processes; for example, where the learner has to choose the odd one out in a group of words, or has to choose the correct verb collocation for a group of phrases, or choose the correct expression to complete a sentence. You can see examples of how we use flash cards here. As you can see, flash cards can be used to practise sounds, pronunciation, vocabulary, multi-word units, as well as idioms and expressions. Flash cards are visual, instantaneous, incorporate audio and have a favourites feature, so that you can tag items that you need to practise more. Why not sign up for one of our courses to experience our flash cards and other great learning tools? Wow, it’s a great pleasure to read this post and to know about these flash cards. It will be best for my kids. Recently I had bought for me some educational flashcards from carddia.com and those helped me a lot to learn Greek language and all. Now I am looking forward to buying some of these cards mentioned here for my kids. Thank you. Thanks for your comment, Ada, we’re glad you found the post useful. Children really enjoy using traditional flash cards and doing online flash-card activities. They’re a fun way to learn.